Terra (SR 1827) is a high-population garden world with a billion or more sophonts in population size and a near-ideal utopian environment conducive to most sophonts. Its economy and population are rapidly growing and living conditions are expected to quickly rise barring outside forces. Government control of this world is by an external military force. This is a high technology world with available technology over the standards for Charted Space. This is a temperate world, with a climate of average temperatures. It is a member of Third Imperium in the Sol Subsector of Solomani Rim Sector and in the Domain of Sol. Terra (SR 1827), as a member world of the Third Imperium, holds the estate of an Imperial knight and the feifdoms of a count and a minor duke. All three are members of the Imperial Nobility charged with overseeing the world. This world has a nearby Naval Base, capable of handling warships. This world has a nearby Way Station. 90% of the world's population is the Major Race Solomani. Less than 10% of the world's population is the Minor Race Dolphin. It is the homeworld of the Solomani, a sophontic species that is a member of humaniti and a Major Race. Sol Primary Yellow G2 V "The Sun"
Diameter: 7,900 miles (12,600 km). Gravity: 1.00g. Please see Terra system for more information. Regions of Terra: Terra's capital is the city of Rio de Janeiro, and the most urbanized and industrialized regions of the world are located in the South American continent, the Caribbean region, and the southern part of the African continent. Terra likewise boasts many undersea arcologies, mostly located in the Pacific Ocean region. Terra has a pressure of 0.71 to 1.49 atmospheres. Terra has eight recognized continental masses: Africa, North & South America, Asia & Europe (together comprising the supercontinent of Eurasia), Australia & Zealandia, and Antarctica. The great northern desert once known as the Sahara has been mostly reclaimed and converted into a mutli-million hectare stretch of farmland. A hydrological project begun during the Rule of Man caused the flooding of the Qattara Depression in the old Libyan Desert region and the diversion of the Nile River, bringing a cooler, moister climate to much of the Sahara region. Africa today is prosperous and cosmopolitan, with the most advanced Imperial technology available there. The AECO (Africa-Europe Cooperation Organization) Starport lies on the shores of the flooded Chott Djerid, in what was once eastern Algeria. Southern Africa is the busiest financial district on the planet, with the Terran Exchange headquartered in old Johannesburg, although most of the trade occurs on the global information net. During the early years of the Long Night, much of the West Siberian Plain was flooded, creating a new arm of the Arctic Ocean of approximately the same size as the Mediterranean Sea. Combined with the warming climate, much of Siberia has become a fertile and agriculturally productive area. The area once known as Mesopotamia and the Indian subcontinent have, oddly, seen a fair amount of Vilani settlement. Many ancient native Terran folkways endure in these regions as well. Eastern Asia has remained a somewhat culturally insular region for thousands of years, and is one of the few significant regions of the planet where people still use a native ancestral language as their first language as opposed to Anglic. Oceania is an expansive region including the various Pacific Islands, Indonesia, Zealandia, and Australia. Many people of this region live in shallow-water arcologies and undersea cities, most of whose commerce is devoted to aquaculture for export. The continent of Zealandia lies off the east coast of the Australian continent, and is mostly submerged beneath Terra's Pacific Ocean. Some of its higher mountain ranges protrude above the surface of the ocean as an island chain known as New Zealand. LaGrange Starport in Western Australia is a busy military starport which services a military reservation taking up much of the Australian desert. Imperial Navy and IISS headquarters are located at Alice Springs. While the port does see some civilian traffic bound for Asia and Oceania, the majority of port traffic is governmental and military. The Hivers have bought a several-hundred thousand hectare tract of land on the eastern coast of the Australia District and set up an enclave from which they sell their cutting-edge electronic devices. Home of 1 billion people, mostly around the Mediterranean. Northern Europe is a quiet region full of preserved towns and cities, where many ancient folkways endure. The University of Terra is centered in Europe, with major campuses in Paris, Berlin and Stockholm. The region formerly known as the Middle-East is a region conscious of its own long history and maintains many ancient languages and folkways. Most of the population of North and Central America live in the regions of old Mexico or the Caribbean, which is today one of the most densely populated regions of the planet and home to many of the planet's most aggressive entrepreneurs. There is a continuous line of arcologies and undersea cities stretching the entire distance from Boston to Trinidad. Phoenix Mesa Starport (a.k.a. "Starport Paulo") is located in the southwestern region of the North American continent, just southwest of the city of Phoenix. Over two-thirds of Terra's merchant traffic passes though this one starport. Like several other ancient cities, the North American city of New York has been preserved (and protected from higher sea-levels) by being encased within a giant transparent dome. The South American continent is the modern center of Terran civilization. Most of the population lives along the coastal areas, the interior of the continent remaining sparsely settled. The capital of Terra and the Sol system as a whole is the city of Rio de Janeiro in the province of Brasilia. High in the Andes Mountain Range on the shores of Lake Titicaca lies the Imperial Residence. Originally built as the official residence of the Solomani Confederation Secretary General in 876, the estate has since become the residence of the planet's Imperial military governor, Imperial Army General Stanislav Gasai, and more recently has been slated to be the residence of Terra's assigned Imperial noble. The Shackleton Community in Antarctica is a site of increasing local emigration, as the warmer climate has rendered significant parts of the continent ice-free. Great undersea arcologies (some extending tall enough to pierce the ocean surface) are the home to billions of Terra's population. Archimedes Station: No information currently available. Copernicus Down Spaceport: Copernicus Down handles traffic control for Terra. University of Luna: The University of Luna is famous for work in high-energy physics and astronomy. Farside Station is famous for work in cosmic ray research and radio-astronomy. Terra is filled with a vast variety of lifeforms, many of which were exported throughout Charted Space during the Rule of Man. The Solomani Hypothesis states that Humans evolved on Terra (Solomani Rim 1827) and were scattered to many different worlds by the Ancients for reasons currently unknown. The result is that many different, parallel human races exist, and coexist throughout Charted Space. Terra is also known as Earth. Origin world of the genetic stock from which all races of Humaniti descended, former capital of the Terran Confederation, former capital of the Terran Mercantile Community (TMC), which later became the Old Earth Union, and former capital of the Solomani Autonomous Region. The word Terran (used in the past to refer to an inhabitant of this world or to a citizen of the Terran Confederation) is derived from the name of this world. Terra is also the source of the non-sapient animal species the Ancients uplifted into the Vargr. 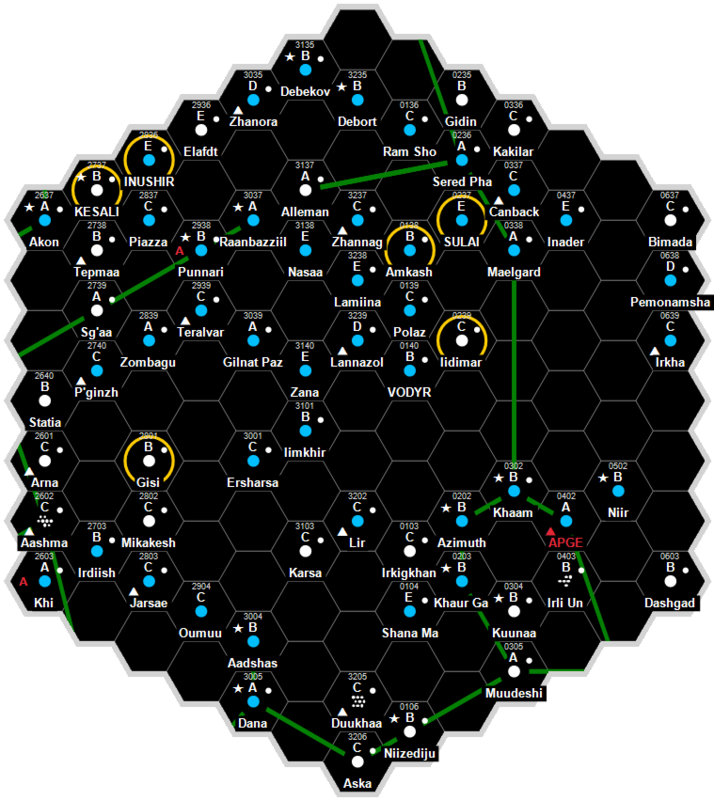 Terra today is an important high-population garden world orbiting the star Sol in Sol Subsector of the Solomani Rim. The system is a member of the Imperium and contains both a Naval Base and a Way Station. Terra is currently under military rule. Terra (SR 1827), as a member world of the Third Imperium, holds the estate of three members of the Imperial Nobility, who are charged with overseeing the world. Terra (SR 1827) has an excellent quality starport. Terra (SR 1827) possesses a Technology Level of TL–15 or TL-F in Hexadecimal Notation. Terra (SR 1827) is a Captive Government or Colony. Marc Miller. Starships (Game Designers Workshop, 1977), 37. Periodical: MegaTraveller Travellers' Digest No. 13 in Article: "The Trouble With Kids"
This page was last modified on 28 March 2019, at 08:38.